Golden Apples: R O Y G—Repeat # 3! Heel turned. Yes, in the light of day, with a clear head, I can turn a heel! This time both sides of the heel match and make a nice sharp V.
This sock had 72 stitches to start—the deep 2 x 2 ribbing and length of the leg were factors in the number, as was the stitch pattern, and the placement. I also wanted a larger number of stitches because the slip stitch pattern, changes the gauge, and I'd rather socks be a bit baggy in the leg, than too tight. But the foot part of the sock only has 60 stitches—I decreased 12 stitches between the leg and foot. Some in the heel flap (and the round just before I started the heel flap), and some in the gussets . For theses socks I wanted a turning that left the fewest stitches (and each style turning results with a different number of stitches left over). Then I just slightly extended the gussets –and hid some decreases in the gusset there--where the decreases are invisible. The change is stitch count is almost imperceptible.--But now that you know it, it's is as obvious as the nose on your face! I don't think they will be completed today—But the end is in sight! 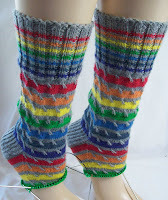 And when I have completed the knitting, the socks will be nearly (or maybe completely!) finished, too. I really like colors organized this way--and I like that lots of other knitter have done ROY G BIV (or ROY G B(i)V socks--and that pretty as they are, they are nothing like mine! I LOVE that site! It's the only way I turn heels, no matter the pattern. I must have it printed out a dozen times so I can carry it around. I love the way your socks are coming out the colors are great. Those socks are really really happy! I bet you're going to feel awesome when you wear them.